This article by Melissa Taboada of the Austin American-Statesman is very concerning. There is a lot of detail to plough through in this piece which also provides a decent history of school closures. That said, Education Austin President Ken Zarifis maintains that "because the majority of the underenrolled schools are in the district’s eastern side, he will not support any closures unless the district first redraws boundaries," and "exhaust all options," generally speaking. The hollowing out of the city core is deeply concerning. This reflects gentrification and the charterization of schools on Austin's East Side. I know that they target the Latino, frequently immigrant, community ferociously. Not speaking about any one charter school, in particular, from my own work in East Austin, I see first hand how our parents fall prey to the glossy handouts and the impassioned sales pitches to lure public school kids out of our East Side schools. Nevermind the data and powerful evidence that show that parents would do really well to think twice before putting their child in a charter school. The shorter and longer game is that we as a polity, as advocates for public education, "poach" these students back into our schools by expanding the programs like dual language education, environmental science, arts programs, as well as community-based programs with high levels of parents involvement, that simultaneously breathe life into the curriculum, schools, and surrounding community. 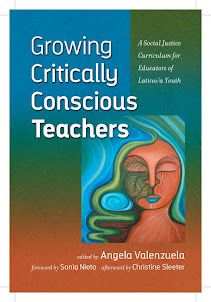 Dual language education and Ethnic Studies could and should be major draws that distinguish AISD not only from charter schools locally, but also with respect to public education in our country, as a whole, where such programs often depend on local champions as opposed to being embedded in district policy and practice. Not that this or any district is perfect, but rather that because governance is local, we as communities can advocate for and seek changes like these that we want, need, and are research-based to boot. John Dewey famously referred to our nation's public school classrooms as "laboratories for democracy." With this as a premise, shuttering schools is bad for democracy. I am happy to read that the district has plans to work with the Austin Mayor Steve Adler and Council Member Kathie Tovo to transform "shuttered campuses into affordable housing or city parks." Although this piece makes me sad, I can only imagine what it's doing to those that are feeling targeted at the moment. After years of putting off a decision to close schools, Austin district leaders are forming a plan that would consolidate campuses starting in August 2020. It’s too early to know which schools will be shuttered or even how the decisions will be made. But district leaders say postponing a decision is not an option as they predict a bleak financial forecast, exacerbated by a plummeting student population, ballooning annual recapture payments to the state, and depleting district reserves. The district must eliminate a $60 million shortfall by next school year. Administrators on Monday will begin discussions with the school board on developing criteria for closing and consolidating campuses. Officials said they would later involve parents and a committee that has been studying the issue. According to a preliminary timeline, criteria and guiding principles would be set by April, administrators would present schools for possible consolidation by May and trustees would make decisions as early as June. The school district for at least the past quarter-century has been criticized for holding on to chronically underenrolled schools. State officials, consultants and district committees since at least 1993 have called out the district for inefficiencies, all recommending shuttering campuses. But such discussions always have been met with public backlash, as parents and students defend neighborhood schools and East Austin community leaders warn against closing schools in a part of the city that for years dealt with the trauma of school closures as part of a desegregation plan that shuttered schools designated as black-only and kept open schools for whites. The district’s financial strains aren’t new, though they’ve been worsening in recent years. District trustees repeatedly have said they will be forced in the coming months and years to make difficult choices, the cuts previous district leaders adamantly opposed, to solve the district’s financial woes. The district’s enrollment has been declining for six consecutive years, but there have been calls to close low-enrolled schools ranging back a quarter century, when a Texas School Performance Review stated Austin facilities were underused and recommended the district close schools. Then in 2000, in a 736-page audit, the state comptroller again recommended consolidations. In 2009, financial consulting firm MGT of America, hired by the district, also recommended taking campuses offline. Within months, the district acted on more than half of the consultant’s recommendations, but shuttering campuses was not among them. And in 2011, a facilities committee tasked with finding inefficiencies recommended closing schools. About 1,500 people showed up to district meetings in one week to oppose the closures. And the school board shelved the recommendations. In 2016, a new facilities and bond advisory committee worked alongside administrators for more than a year to create a facilities master plan, which was adopted in 2017, and also suggested schools should be closed. The consultant initially working on the plan identified schools for closure, but the committee’s facilities report did not list specific campuses. Instead, it called on the school board to examine whether schools should be closed after three consecutive years of low enrollment. Trustees approved that plan, with safeguards to provide underenrolled schools resources and support to help boost enrollment before they would be considered for closure. Most recently, an administrative plan to balance the budget listed 12 schools that could be closed to help narrow the gap. Then in January, a budget stabilization task force found that the district could save $1.2 million for each closure, pointing to 15 elementaries with fewer than 300 students, but did not name specific schools. The majority of the more than three dozen schools with enrollments under 75 percent of capacity are located east of Interstate 35. Some rank low by state testing measures and count high numbers of Latino and African-American students from low-income families. District leaders, including some trustees and administrators, have said students who attend aging, underenrolled schools would be better off attending modernized or new campuses with strong academic programs and brimming with students. Low enrollment won’t be the only factor in identifying schools to close, Superintendent Paul Cruz said. Other criteria will include the physical condition of schools and their educational suitability, he said. Consultants three years ago performed complete facility and educational suitability assessments of every school. Several trustees also have said they want to consolidate schools in an equitable way, which could mean closing schools that are not under-enrolled west of Interstate 35. 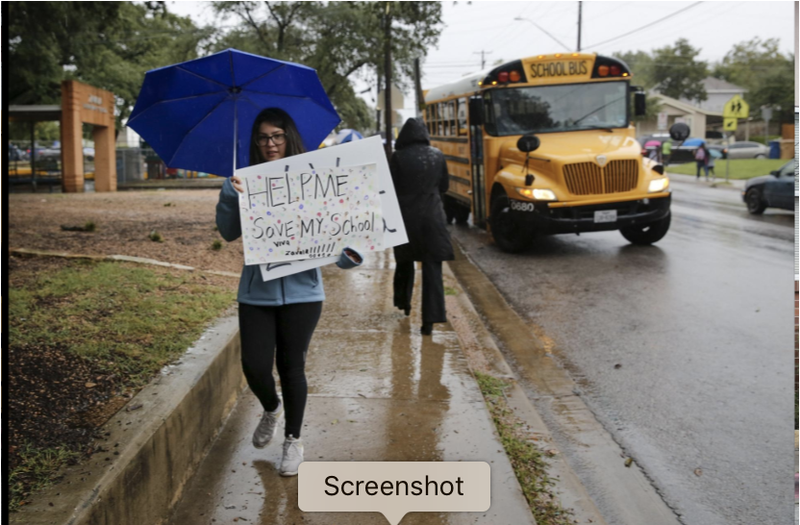 The 80,000-student Austin district has declined by more than 6,000 students since 2013, which equates to about $115 million in lost state funding. School district administrators and demographers attribute the enrollment declines to a number of factors, including transfers to suburban districts and charter schools, and birth rates that declined with the 2008 recession. The number of school-age children living in some pockets of the district is falling, a phenomenon common among urban districts. Demographers describe the loss as a doughnut-shaped hole in the city, where the core has more schools with vacancies. Schools in other parts of the district continue to grow. Despite a housing boom downtown and areas near downtown, few new homes built in those areas are designed for or marketed to families. At the same time, the new housing is driving up real estate prices, pricing out lower-income families. The average market value of homes in the Austin school district last year was $441,067, much more than the average market values of homes in Del Valle ($184,059), Hays ($205,261), Pflugerville ($255,785), and Round Rock ($340,767) — four area districts that attract Austin families. The enrollment decline comes even as the district has enacted countermeasures, including adding prekindergarten for 3-year-olds, starting tuition-based prekindergarten classes, launching a marketing campaign and opening doors to students who live outside the district boundaries. The district has picked up about 2,400 students by allowing transfers from other districts. District officials also have been working with underenrolled schools, allowing specialty programs, such as a dual language program at Becker Elementary in South Austin, a fine arts program at Blackshear Elementary in East Austin, and a dyslexia program at Covington Middle School in South Austin and providing money to market those programs. Without those efforts, the declines could have been steeper, but critics say the district has not included surrounding communities for input or done enough to help the struggling schools. District officials over the years have discussed solutions to address the district’s overcrowded and half-empty schools. But talks about possible school closures and boundary changes have long been contentious in Austin. 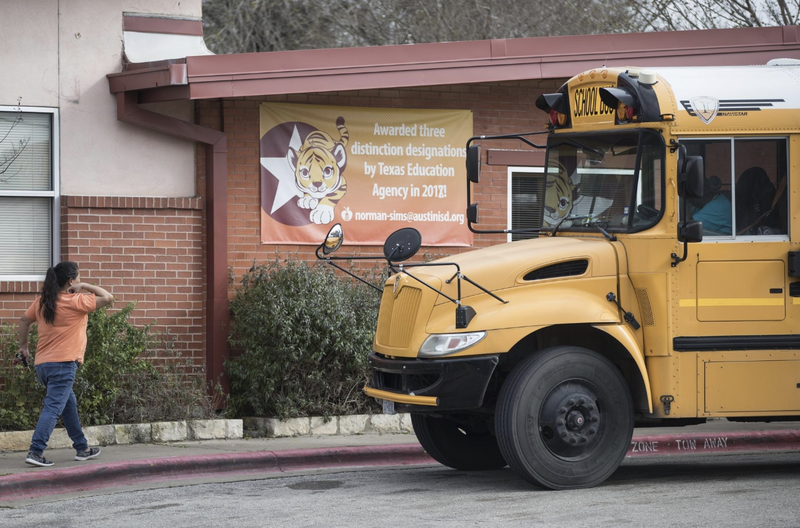 Thirty-seven Austin district schools are at or below 75 percent capacity, the threshold the district considers when defining campuses as underenrolled. But nearly an equal amount, 38, enroll more than 100 percent of capacity. In some pockets of the district, particularly in Northwest and Southwest Austin, overcrowding is common, with schools beyond 150 percent capacity. Three elementary schools in those areas have more than 1,000 students, the size of the district’s larger middle schools. But other campuses, primarily in East Austin, are half-empty, with one at 29 percent. Critics have said the district is pouring millions of dollars into repairs of old buildings, which diverts money away from academic goals. A January report by the Budget Stabilization Task Force also called on the district to shutter schools, but told trustees that cuts must not have “a disproportionately negative impact on certain parts of the district, namely East Austin.” Specifically, the report said closures cannot be limited exclusively to schools that are underenrolled, and recommended consolidations and any boundary changes should increase socio-economic and cultural diversity at schools and must be balanced east and west of Lamar Boulevard. Attorneys with the Texas Civil Rights Project in 2014 warned Austin district officials against closing schools on the eastern side of the district. Other proponents of keeping schools open have said closures of underenrolled schools would have a disparate effect on already marginalized neighborhoods. One group of regular district activists have threatened to organize an independent district or to be absorbed into a neighboring one. Ken Zarifis, the president of labor group Education Austin, and one of the task force members, said because the majority of the underenrolled schools are in the district’s eastern side, he will not support any closures unless the district first redraws boundaries. “We need to exhaust our options before looking at closing schools, but we haven’t done that,” Zarifis said. Nationally, 1,573 schools, mostly elementary campuses, were closed in 2014-15, the most recent data available, according to the National Center for Education Statistics. Closures have been common among major urban school districts, with dozens shuttered in Chicago, and Washington, D.C. The Dallas district also has closed multiple campuses in recent years. Dallas school leaders last year proposed shuttering more, a plan that was met with resistance and prompted them to scale back to just a few. Some experts warn there are repercussions to shuttering schools: Home values often decrease in the neighborhoods with closed schools; parents, particularly those in low-income neighborhoods, have more difficulty getting their children to the new campus locations, and building a sense of community and parental engagement becomes harder. Some see in suggestions of focusing closures in East Austin an echo of the city’s rocky history of desegregation. As part of the desegregation efforts, the district in 1971 shuttered the original L.C. Anderson High School, which served as a place of pride for many in East Austin’s African-American community. Parent Emily Sawyer, whose children attend two underenrolled schools said district leaders must be “bold and undeterred by discomfort” in determining what equity should look like in the district as officials approach consolidations. Some political heavy hitters, community and civic groups are making moves to support the district as it navigates school closures. Austin Mayor Steve Adler and Council Member Kathie Tovo late last month raised the idea of transforming shuttered campuses into affordable housing or city parks. Adler and Tovo in a joint statement said as the district faces possible closures, the city simultaneously faces a lack of affordable housing, places for parks and public facilities to meet community needs. “Perhaps these two sets of challenges can add up to one good answer for our community: opportunities for some community needs to be met on all or part of repurposed AISD properties,” they said. The city passed a resolution for the two entities to work together to use district facilities in a way to benefit the community. The school district already has sold surplus land (though not schools) to developers and the city, stipulating that at least a portion of it be used to develop affordable housing, prioritizing district families and staff for such housing. Leaders of the Greater Austin Chamber of Commerce also in January met with district officials, offering to support a strategic communications plan that explains to the public the need to make hard choices. 1971: The original L.C. Anderson High School, designated for African-Americans, which opened in 1889, closes. 1976: The original Palm School, which opened in 1892 and later served primarily Latinos, closes. 1993: Texas School Performance Review recommends closures. 2000: Texas School Performance Review again recommendations consolidations, selling headquarters. June 2007: Porter Middle School, which opened in 1958, closes. Aug. 2007: Porter reopens schools as Ann Richards School for Young Women Leaders. June 2009: Financial consulting firm MGT of America tells district leaders they can save millions of dollars with job cuts, school closures. Early Jan. 2011: A district-led facilities task force identifies nine schools that could be closed or revamped for efficiency’s sake: Barton Hills, Brooke, Joslin, Oak Springs, Ortega, Pease, Sanchez and Zilker elementaries, as well as Pearce Middle School. Late Jan. 2011: District staff presents new options, including closing four more schools — Becker, Blackshear, Dawson and Govalle elementary schools — and revamping Garcia Middle School into a grades-four-to-eight campus, turning Overton and Jordan elementaries into prekindergarten-to-third-grade campuses and transforming Martin Middle School into an all-girls campus. Feb. 2011: The facilities task force presents its draft report to the school board, which does not name specific schools for closure and instead highlights areas of the district with over-capacity and underenrolled schools. The report also pushes back closures to the 2012-13 school year. March 2011: Superintendent Meria Carstarphen presents a budget plan to school board, which scraps closures for 2011-12, but would eliminate 1,150 jobs, even those under contract, and slashes school programs. Sept. 2011: District officials recommend the board shelve the task force proposal that includes closures. Aug. 2013: District enrollment declines, beginning what will be a multi-year trend of declining enrollment. June 2014: The board considers a new 10-year facilities master plan. June 2014: The district closes Pearce Middle School and Garcia Middle School. Aug. 2014: Sadler Means Young Women’s Leadership Academy opens at the former Pearce Middle School and Garcia Young Men’s Leadership Academy at the former Garcia Middle School. Sept. 2014: The Texas Civil Rights Project warns Austin district officials against closing schools on the eastern side of the district. Dec. 2016: Consultants Brailsford & Dunlavey Inc. release a preliminary report on a 25-year master plan that calls for closing up to 10 aging schools in poor condition: Brooke, Dawson, Joslin, Ortega, Pecan Springs, Ridgetop, Sanchez and Sims elementaries and Lucy Read Pre-Kindergarten and Dobie Pre-K Center. Some would be replaced and others shuttered for good. Jan. 2017: A facilities and bond planning advisory committee recommends keeping open Ortega and Pecan Springs elementaries and suggests closing Norman Elementary instead of Sims Elementary. Consultants estimate the moves will save $15 million annually. No closures are recommended until at least 2022. Jan. and Feb. 2017: Parents and community members submit petitions to keep the schools open. Mid Feb. 2017: The committee asks for more time to complete the facilities plan. The district postpones a public hearing on the issue. Late March 2017: The committee’s revised facilities plan narrows the closure list to five: Brooke, Dawson, Joslin, Norman and Sanchez elementaries. District officials say those campuses could stay open if enrollment rises above 75 percent capacity. April 2017: A divided school board approves the 25-year facilities plan that does not include a list of schools to close. Instead, the plan calls for chronically underenrolled schools to be closed, but offers so-called target utilization plans to give the schools a chance to increase enrollment. June 2017: District documents show officials are counting on $40 million in land sales and could shutter a handful of East Austin schools to lower the total cost of a bond package to $1.05 billion. Dec. 2017: District documents show six schools could be consolidated, with the first as early as 2018: Brooke, Norman, Sims, Metz, Sanchez and Zavala elementaries. Dec. 2017: Parents push back against closure timelines. Superintendent Paul Cruz apologizes, promises to change timelines and involve the community in the closure process. Dec. 2018: Administration documents show the district could save $12 million over three years by closing 12 schools. The documents don’t list campuses for closure but show two schools could be closed as early as 2019-20, with seven more shuttered in 2020-21 and three more in 2021-22. Jan. 2019: Among 43 recommendations to save the district money, the district’s budget stabilization task force says as much as $1.2 million could be saved for each school closure. No schools are listed but the report highlights that 15 elementary schools serve fewer than 300 students. The task force warns against closing only low-enrolled schools and urges district leaders to first overhaul school boundaries.